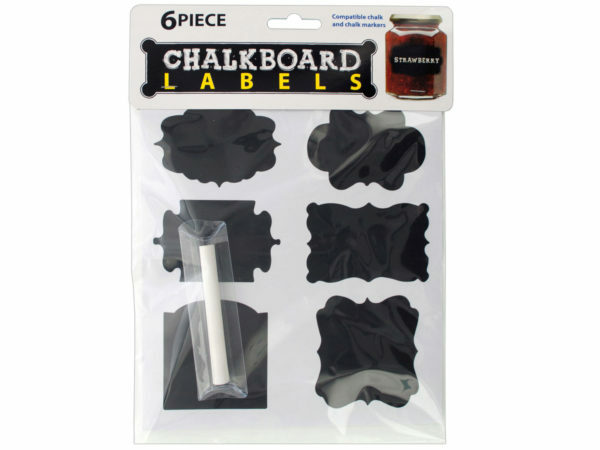 Great for labeling homemade jams, gourmet food gifts and more, this 6-piece Self-Adhesive Chalkboard Labels Set features decorative labels made of black plastic that can be written on. Set includes 6 labels in various shapes and 1 piece of chalk. Labels are compatible with chalk and chalk markers. Labels measure approximately 2" to 3". Comes packaged in a poly bag with a header card.